Authorities have discontinued an an Amber Alert for a 2-year-old boy last seen in Burkburnett. The police department describes Eli Scott Smith as white with blonde hair, blue eyes, and about three feet tall. He was last seen wearing blue jeans and a light blue jacket with a truck on it. 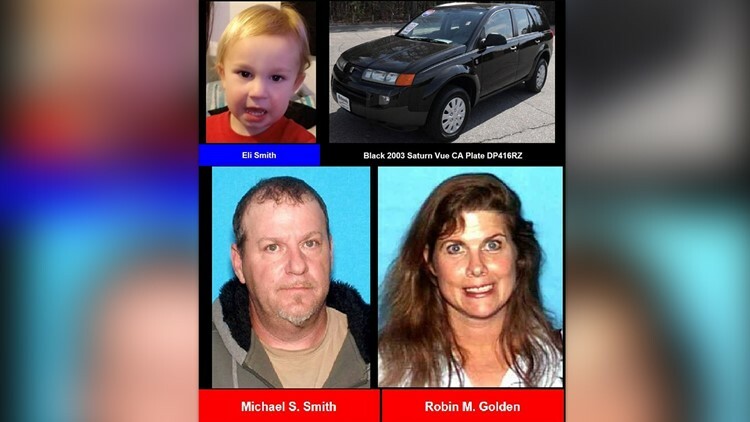 Police are searching for Michael Scott Smith, 48, and Robin Michelle Golden, 51, in connection with the boy's abduction. Both are white with brown hair. Smith is wearing a black Fox hat, a blue shirt and blue jeans. They are believed to be driving a black 2003 Saturn Vue with a California license plate reading DP416RZ.